I accidentally deleted my picture of the full pie so a half pie picture will have to do! Since I am on a cooking/baking kick as of late, I wanted to share two dessert recipes that I made in the last week. Both are easy and delicious. Key Lime Pie is a favorite summer dessert for our family. 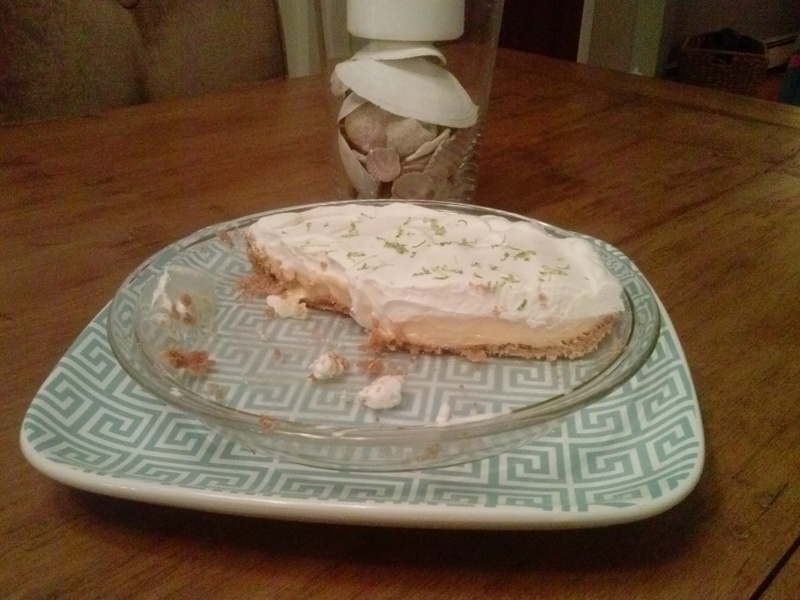 I have several Key Lime Pie recipes in my repertoire. This one is actually called Ultimate Lime Pie and is technically not a Key Lime Pie as it uses limes instead of key limes. One word about the crust—make the graham cracker crust from scratch. You really will notice a difference in taste from the store-bought version. As long as you have some graham crackers, you can make this crust. It is definitely worth dirtying the food processor! Heat the oven to 375 degrees. In a food processor, pulse the graham crackers and 2 Tbsp sugar to form fine crumbs (you should have 1 ½ cup crumbs total). Add the butter and pulse to combine. Press the crumb mixture into the bottom and sides of a 9-inch pie plate. Bake until golden brown, 12 to 15 minutes. Let cool. Reduce oven temperature to 350 degrees. In a bowl, whisk together the condensed milk, egg yolks and lime juice. Pour the mixture into the cooled crust and bake until the center is just set, 12 to 15 minutes. Transfer to a wire rack and let cool completely, about 1 hour. Just before serving, using an electric mixer, beat the cream and remaining 2 Tbsp sugar in a large bowl until soft peaks form. Spread the whipped cream over the pie and sprinkle with the zest. Yum! 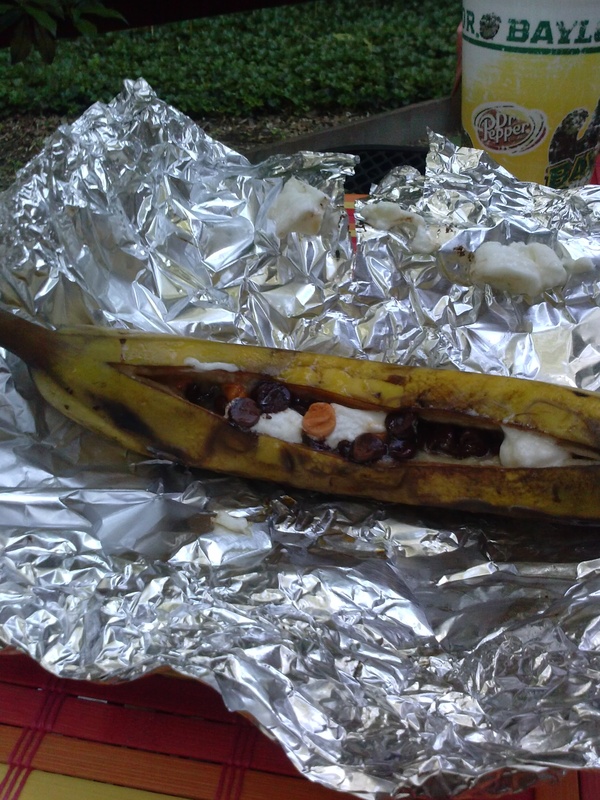 On Sunday, for our Father’s Day cookout, I decided to make banana boats on the grill. I did a quick search online for ideas and found many. For our banana boats, I used chocolate chips, butterscotch chips and marshmallows. I didn’t have any mini marshmallows on hand so I cut up a regular-sized marshmallow and it worked fine. However, next time I would lightly spray the foil with cooking spray so that chocolate chips and marshmallows don’t stick to the foil if they fall out of the banana. toppings—chocolate chips, bits of candy, pecans, crushed graham crackers, Nutella, peanut butter, whatever strikes your fancy! Slice the banana down the middle, leaving an inch or so on each end. Make your cut about ½ inch deep. Stuff the banana with whatever toppings you like. Wrap the banana in foil, creating a foil-covered banana. Place on the grill for 5 minutes or until toppings are melted. Use a spoon to eat all of the goodness inside. If you are doing this in the oven, I would try a 400 degree oven and check the bananas after 5 minutes. FYI, don’t be alarmed if the banana skin turns black. Everything inside the skin is good! All of my favorites this Easter(minus my kids, though)—flowers blooming in Gramercy Park, good food @barbounianyc, gelato @amorinogelatobh , and most importantly, celebrating the risen Lord @calstgnyc!